In a world that is getting more and more fast-paced and technological, it is more important than ever that children have a space to call their own, to take time out in, to play in, a space that is safe, secure and scaled to them. 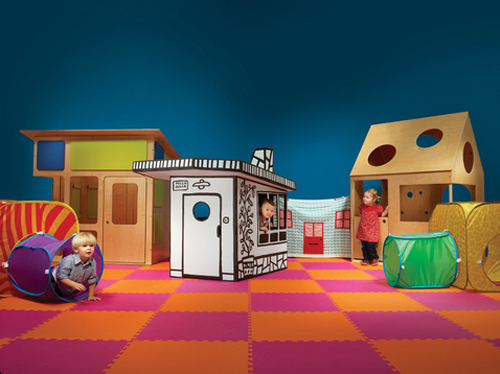 That is why it is great to see designers taking the time to design playhouses that enables this. 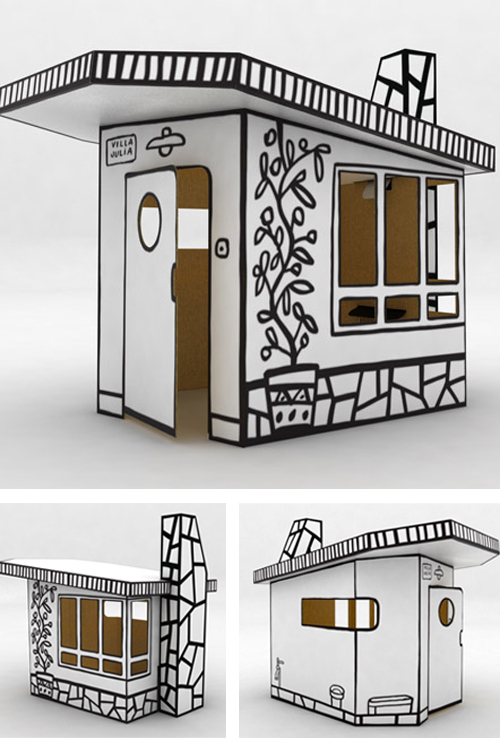 Here are some well-creafted and ' designer' examples of 'modern', simple and contemporary miniature 'play' houses that are available for young children today. All of which are pretty pricey, at around $1,000-$1,500 suggesting that demand isn't high enough for mass manufacturing. Designed by California-based Modern Cabana this is one sophisticated playhouse! 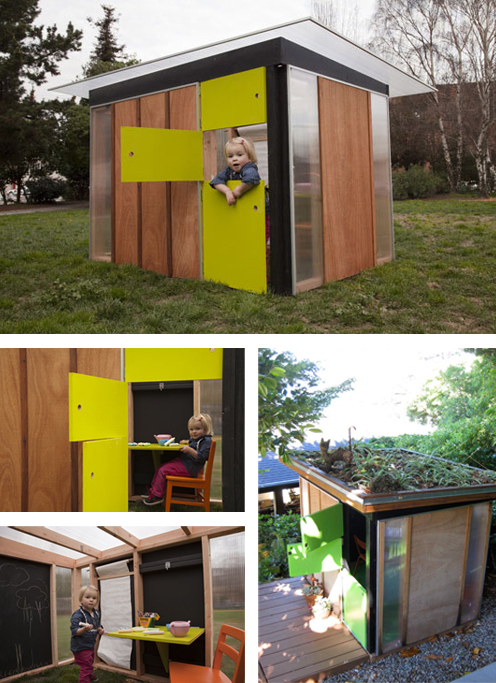 Including built in furniture, a roll of paper for art, blackboards and can even come with a green roof and deck! I also like the green door that can be opened in three parts. Via Inhabitots and Modern Cabana. 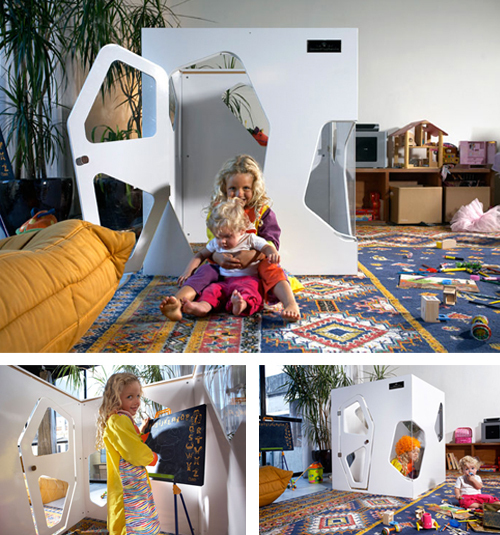 A more simple design by San Francisco-based Modern Playhouse, this playhouse uses one (natural sustainable wood) material with shapes cut out of each panel. Again, the house can be furnished with custom made built in (and matching) furniture components. Via CalFinder Blog and Modern Playhouse. This playhouse by True Modern who designs 'child-friendly' furniture also features paper holders for art and a clean, simple, contemporary and 'eco-friendly' aesthetic. Via Dwell and True Modern. This indoor playhouse called Kyoto and inspired by Japanese avant-garde architecture by Smart Playhouse looks visually appealing, but does little more than than look, well...nice. Via Modern Kiddo and Smart Playhouse. 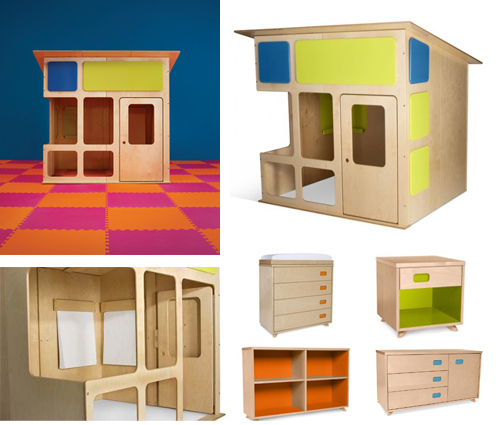 The Villa Julia designed by Javier Mariscal for Magis was part of the Me Too collection - designed products for kids. 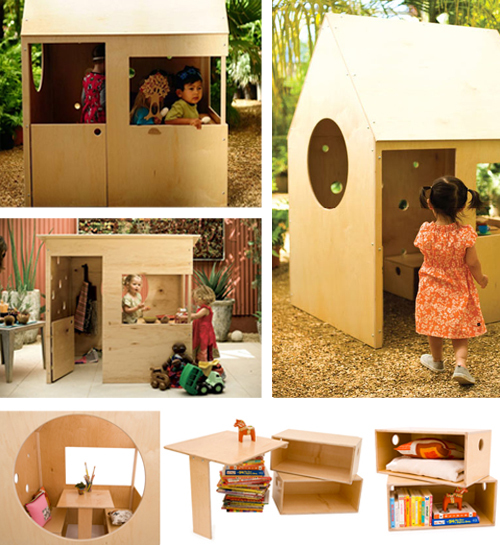 This playhouse has the advantage of being not only cheaper, being made from cardboard, but it is also recyclable! It also comes with stickers for the children to personalize. 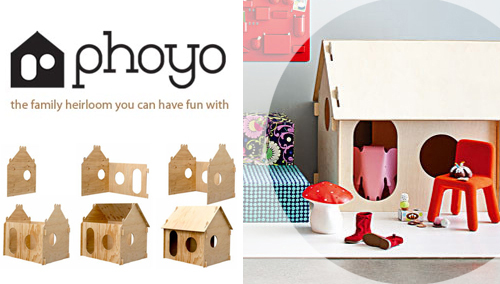 Architect Robin Hannah created the phoyo playhouse originally for her three young children - "I began planning a series of panels that would interlink with one another to form an enclosed space to suit young children". You can see the ease at which the panels - walls & roof can be quickly and easily arranged and constructed making for a fun and memorable experience for both children and adults. thanks robin, have updated post and added phoyo in!